The Outworldz One-Click Hypergrid is a Microsoft Windows-compatible virtual reality Opensimulator system that is easy to install, easy to run, and powerful. It it free and is open source. Usually you can just run the Help-Network Diagnostics and it will tell you what to do. But you may want to troubleshoot manually. It is easy to add or change regions. Each region has a control panel. Click the Advanced Button in the menu and open the Advanced screen. Then click "Add Region" or "Configure Regions". A menu will appear. Enter the name of your new region and click "Save". The region size can be anything from 256 X 256 to 1024 X 1024, or higher. Huge region sizes such as 4096 X 4096 can be used, for flying or car racing. If you go over 8192 X 8192, you can expect it to be slow as the land size gets very very large and laggy, exponentially. Always use a square sim size. Use multiples of 256 - 256X256, 512X512, and so on. Don't change the UUID unless you want to start over. Altering the UUID will force the system to create a new, blank region the next time it is started, and you will be forced to move your region to another spot. 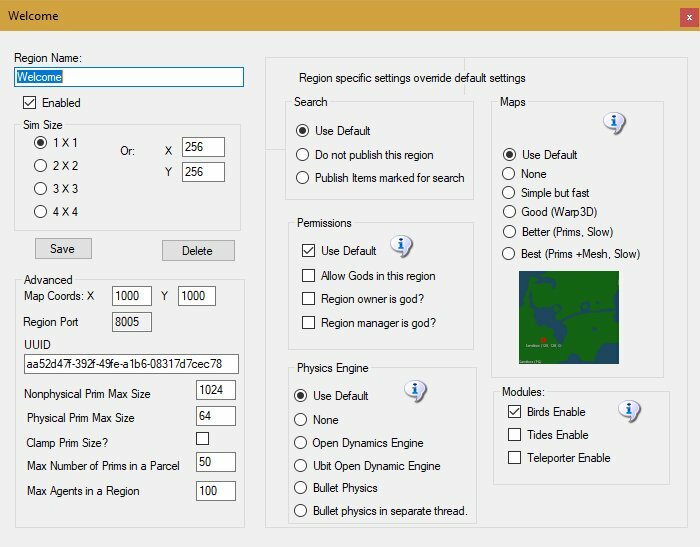 You can set regions next to each other by changing the X and Y coordinates and restarting the region. The X and Y is the lower left point on the global map. You can replace 4 single regions with a single 2X2 region and there will be no lag when crossing the (nonexistent) border. Vehicles can move smoothly anywhere. Also, NPCs can move about freely. Look in any region settings panel and you will see a "size" box. Check the 2X2 box, save it, and restart the region. It will grow North and East and will be 4 times larger overall. You will also need to move it in X and/or Y, or delete the other regions as regions cannot overlap. You can shrink them, too, but objects that fall off the right and top edge will be lost. Another rule to follow is you can only set regions of the same size next to each other. The photo is part of my setup at Outworldz. 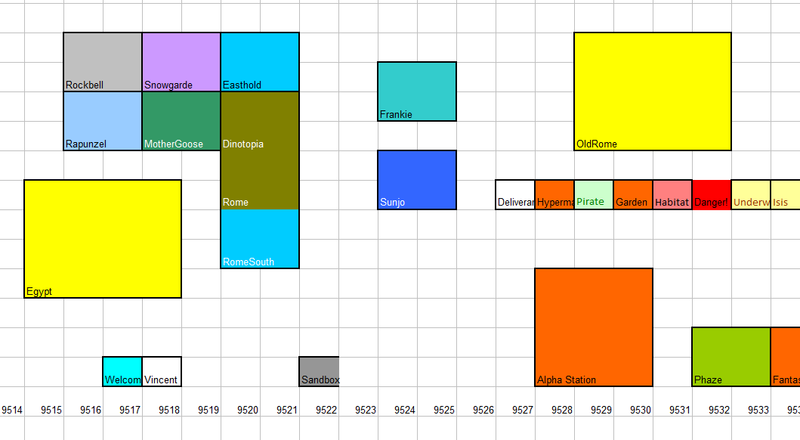 You can see where I moved Egypt away from the Mother Goose region as I changed Egypt from 4 2X2's to a single 4X4. This allows NPC's to be able to move everywhere. Egypt, a 16-region simulation of Alexandria, is modelled after Assassins Creed Origins. It has horses and chariots, elephants, camels, and other ridable animals, so I made it all one big sim. If enabled, the system will make OAR backups of each region. 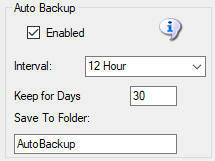 The sim must be continually on for automatic backups to operate. Files that are older than "Keep for Days" number will be deleted. The OAR files will normally be placed in the \OutworldzFiles\AutoBackup folder. Click the Save To Folder field and it will let you select another folder - and you can use a \\network type folder. Grid god mode allows certain users to take and control permissions over objects. Setting Grid God Mode on allows you to control individual users by editing their access level in the Wifi Users Panel. Any user with a level > 100 will be a grid gid. You can set any estate owner or estate manager to be a grid god, too. Allow gods can be used by itself for users that have Wifi permission levels of over 200. God mode is a useful function. However, making copies of items that are no copy or no transfer and giving them to others could be illegal. Please remember that copyright laws for your country need to be respected. Opensim has many different maps settings. I've set up 4 easy to use combinations. Be aware it can take a very long time to boot when using the slower, more pretty maps. The Opensimulator Physics selection box lets you use no physics, or very basic physics, where the only collidable object is a box shape. It supports the original Open Dynamic Engine physics. The ubODE engine, by Ubit Umarov, is an advanced version of ODE that is closer to Second Life compatibilty with vehicles. Bulletsim is an award winning physics engine. Running Bullet in a separate thread is the default. This setting controls the speed of the chat text on the main screen. The wallpaper cycle time defaults to one minute, and can be disabled by setting the number to 0. You can also click the screen to advance through the settings. All images are unretouched screen grabs from Open Sim and Second Life. Don't like Dragons? The viewer splash screen can be set to any web site. A good choice is your own login screen. You can enable or disable Hypergrid access with the first switch. If set to Enable, you must have compatible router and ports must be forwarded. The Suitcase switch will enable and disable a security feature. If checked, all transactions in foreign grids must go through a Suitcase folder. This helps protect your inventory from rogue grid operators. if set to off, you will be able to access any item in your inventory and ot just your suitcase when you are on another grid. 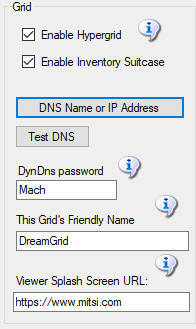 You can set up a DNS name for your grid. You can enter any Outworldz.net name, such as AnyNameYouWant.Outworldz.Net. This will work anywhere in the world. People can use it to get to your grid. If you already have a DNS name from another Dynamic DNS vendor, you may enter it here. This will be your grids main address. If left blank, the system will use the local LAN address and Hypergrid will not be available. The DNS password protects your name from being taken by others. If you lose this password, you will not be able to use your original name. Contact me if you need to have this password reset. The Viewer Splash page is shown when you log into your world. It can be any web address, including http://Yourname.Outworldz.net:8002. The UPnP checkbox will enable a Universal Plug and Play that will automatically open ports. This does not always work, so you may have to Port Forward the ports shown here. Diagnostic Port: (Default: 8001) The program starts a TCP/IP listener on this port for diagnosis before Opensims starts. A TCP socket connection from www.outworldz.com is triggered by HTTP. If this inward-facing probe succeeds, the diagnostic passes. No personal data is sent, and it is not possible for anyone to retrieve any data from the diagnostic port. This checks to see if the firewall and your router are properly set up. 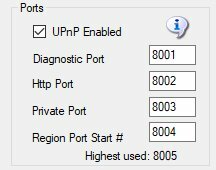 Public Port: (Default: 8002) The simulator and services such as Wifi use this port. It must be open to the internet for Hypergrid to work. The program locally probes this port to detect if Opensim is starting. Private Port: (Default: 8003) There are also a set of private services (asset, inventory, etc.). By default, these run on port 8003 (TCP only) and it should not be made accessible to viewers. Port 8003 should only be accessible to the machines which are being used to run the grid. DO NOT OPEN THIS PORT ON YOUR FIREWALL. The Dreamgrid system will automatically use ports starting with the Region Port Start #. Default is 8004. Each region will be one port larger. You need to have as many ports as it lists forwarded to your computer for HG to work. 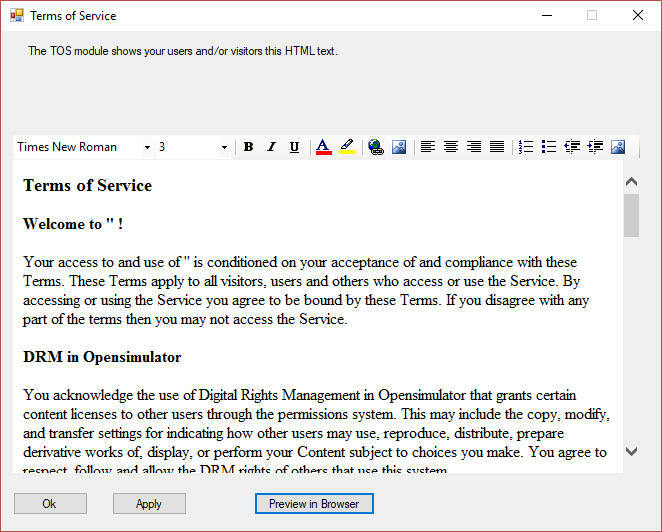 There is a screen for entering and enabling a Terms of Service (TOS) to local and/or hypergrid users. Using the provided example Wifi.ini file you have an indication that you can select one of three default appearances for newly created avatars set up via Wifi. But in a new environment you must set those avatars up first. 1. Create the avatars with names "Female Avatar", Male Avatar", "Neutral Avatar". and authorise them via the Wifi Admin is that is required. 2. Login as each avatar in turn... they will appear as a cloud initially and then usually rezz to the "Ruth" wearing four basic body parts, new pants and new shirt. Note these parts from from the OpenSim Library and MUST NOT be worn in your final appearance for the default avatars. You can COPY these library parts into the avatar's inventory if you wish, or create new body parts and clothing, but before you finish you should remove any items that show as "worn" that are located in the OpenSim Library as those will not rezz on avatars created based on these models. 3. Add any other mesh, clothing, attachments or HUDS you wish to appear on the avatars. This work would not be possible without all the thousands of contributions of the Opensim community. I am especially grateful to the marvelous Diva Canto, aka Dr. Crista Lopez, of the University of California.